Imagine life in one of Florida’s most active 55+ communities. You begin your day with a refreshing dip in the pool, spend your afternoon on a well-manicured golf course, share laughs with friends in the Big Cypress Grill and Tavern, and eventually retreat to your Florida dream home for the evening. Even if you don’t play golf, there is an abundance of other activities to partake in as a community resident, such as fitness classes, tennis, line dancing, bingo, fishing, and Bible study, just to name a few. If you think this type of lifestyle is out of your price range, think again. At Cypress Lakes in charming Lakeland, FL, we offer a variety of new and pre-owned manufactured homes at amazing prices, so living a resort lifestyle is surprisingly affordable. Have easy access to countless activities – Whether you’ve had a lifelong love of fishing, golfing, tennis, or billiards, or want to take up an exciting new hobby, you’ll be able to explore your passions at Cypress Lakes. As one of Florida’s most active 55+ communities, we have a club for just about every interest imaginable and our community hosts countless organized events and activities in our clubhouse that features a restaurant and tavern, media room, ballroom, and much more. Enjoy the very best in Florida living – If you’re a golfer, two 18-hole championship golf courses will win you over. For the non-golfers, however, the golf course views, alone, will take your breath away. From the heated resort pools, tennis courts, bocce courts – and more – an active Florida lifestyle has never been easier to attain. And, while some 55+ communities leave tedious tasks like grounds keeping and trash pickup for residents to complete, Cypress Lakes performs these services for you. Rather than carry out these routine maintenance tasks, you can spend more time relaxing and enjoying the Florida lifestyle. Be in close proximity to many local attractions – Because Cypress Lakes is centrally located between Tampa and Orlando, you’ll have easy access to twice as many local attractions. 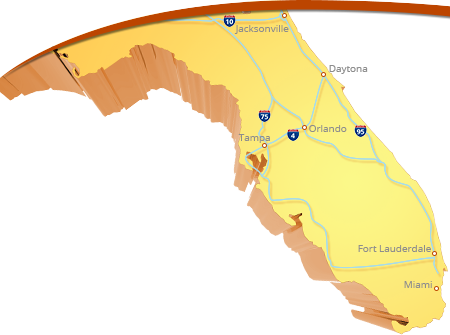 Tampa is home to Busch Gardens, large shopping centers, and several professional sports teams – the Tampa Bay Buccaneers, Rays, and Lightning. Plus, you’ll be just a short drive away from Disney World, SeaWorld, and everything else Orlando has to offer. Despite our convenient location and amazing amenities, Cypress Lakes makes Florida living affordable. Our gorgeous new and pre-owned manufactured homes, which are sturdily built to HUD Code, are a smart investment and offer incredible value. Unlike many other 55+ communities in Florida, Cypress Lakes offers leased and purchased land, making the resort lifestyle an affordable option, no matter your budget. You can even design and build your custom dream home for less than you might have ever imagined. If you’d like more information about what makes Cypress Lakes one of the premier 55+ communities in Florida, contact us today and speak with one of our friendly lifestyle consultants. Don’t forget to ask about our Lifestyle Discovery Program and schedule a stay in one of our furnished guest homes. Our parent company, Blair Group, owns and operates several other 55+ communities in Florida. If you’re interested, be sure to ask for more information about these communities, too. Click here to learn more about Cypress Lakes!